Over the past two weeks, we've looked at Pilate and the chief priests and their parts in the Easter story. Today I want to look at Judas' betrayal of Jesus. "Then Judas Iscariot, one of the twelve disciples, went to the leading priests and asked, “How much will you pay me to betray Jesus to you?” And they gave him thirty pieces of silver. From that time on, Judas began looking for an opportunity to betray Jesus" (Matthew 26:14-16). The Bible doesn't tell us anything about why Judas betrayed Him, though people have speculated that Judas was looking for a king who would overthrow the Romans, who had conquered Israel. 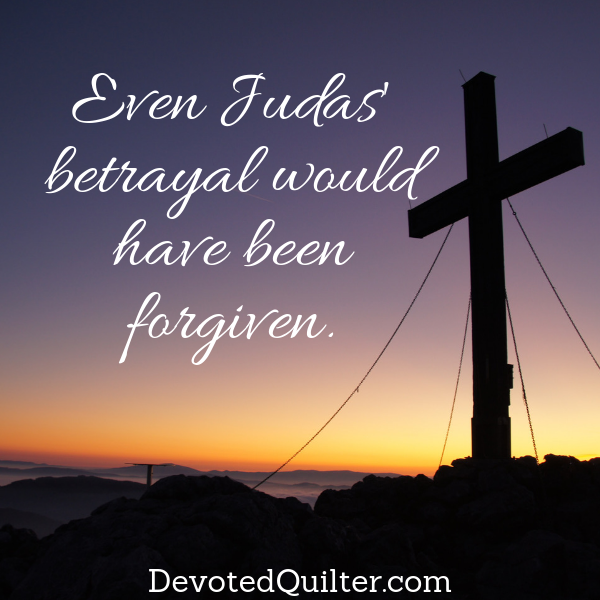 When it became apparent that Jesus wasn't going to do that, Judas betrayed him. Whatever his reason, I think it's interesting to note that it was Judas who approached the chief priests, not them coming to ask him to betray Jesus. Judas took the initiative to get rid of Jesus and even to make a profit from doing it. When the time came, Judas brought "a crowd of men armed with swords and clubs...sent by the leading priests and elders of the people" (v. 47) to arrest Jesus in Gethsemane and "had given them a prearranged signal: 'You will know which one to arrest when I greet him with a kiss.' So Judas came straight to Jesus. 'Greetings, Rabbi!' he exclaimed and gave him the kiss" (vv.48,49). The next morning, "When Judas, who had betrayed him, realized that Jesus had been condemned to die, he was filled with remorse. So he took the thirty pieces of silver back to the leading priests and the elders. 'I have sinned,' he declared, 'for I have betrayed an innocent man. '...Then Judas threw the silver coins down in the Temple and went out and hanged himself" (Matthew 27:3-5). What I can't help but wonder is what did he think was going to happen? He hanged himself upon realizing that Jesus was going to die, so obviously that wasn't his intention, but what did he intend? Was he aiming to have Jesus discredited, so people would stop following Him? Did he hope Jesus would be arrested and put in prison? Did he never really think about what would happen to Jesus, instead only focusing on what he stood to gain by turning Jesus in to the chief priests? We don't know what he expected to have happen, but when he realized that Jesus was going to die, he was so crushed by his guilt that he committed suicide. I remember once hearing someone lament that because he committed suicide, Judas never got to experience Jesus' forgiveness. It was the first time I ever thought about how Jesus would have reacted to meeting Judas again after His resurrection, had Judas still been alive. Can you picture Judas, trying to make himself invisible, so Jesus wouldn't notice him? Or maybe falling on his knees, apologizing over and over for all the pain his actions caused, cringing from the anger he expected? Never in a million years would he have expected the love and forgiveness we know Jesus would have given him. No matter how big our sins are, God's grace is always big enough to cover them. Even Judas' betrayal would have disappeared under the covering of His grace and love. That goes for all of our sins, too. I really hope that in his last moments, Judas cried out for forgiveness... I know that it would have been given!